In 2014 ten years of jewelry in the Pinakothek der Moderne were celebrated with a new, ‘revisited’ exhibition in the Danner Rotunda. 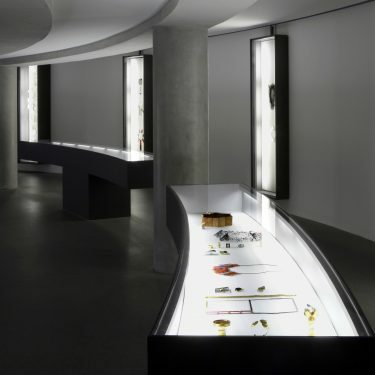 Since 2004 Die Neue Sammlung has incorporated contemporary jewelry in the Pinakothek der Moderne in its permanent display in the Danner Rotunda as well as in temporary exhibitions. As such, one of the most multifaceted artistic forms of expression today is permanently being presented in a museum of this type for the first time alongside art, architecture, graphic works and design. The Danner Rotunda forms a central core in which exhibits by more than one hundred jewelry artists from around the world are shown – thanks to the commitment of the Danner Foundation with its extensive collection and private donors, as well as gifts from individual jewelry makers. The first presentation was curated by Prof. Hermann Jünger, the director of the jewelry class at the Munich Art Academy between 1972 and 1990, together with Otto Künzli who took over the professorship in 1991. Through the revamping of the Danner Rotunda in 2010, Karl Fritsch – as the representative of a younger generation – set a completely new accent. Subsequently Otto Künzli was once again overhauling the collection for the reopening of the Danner Rotunda in 2014 which includes exhibits solely from the Danner Foundation’s and the museum’s own holdings without any loans. Whilst forming a link to the concept of the initial installation, the protagonists in the international world of jewelry are shown in a new light, reciprocal effects can be highlighted, associations provoked and dynamic correlations created between the works.